With a stay at Stintino Country Paradise in Stintino, you'll be near the beach and close to Museo della Tonnara and Pazzona Beach. This family-friendly hotel is within the vicinity of La Pelosa Beach and Ezzi Mannu Beach. Take in the views from a terrace and a garden and make use of amenities such as wireless Internet access (surcharge). Enjoy Mediterranean cuisine at Geranio Rosso, a restaurant where you can enjoy drinks at the bar and dine alfresco. Or stay in and take advantage of the room service (during limited hours). Buffet breakfasts are available daily from 8 AM to 10 AM for a fee. This hotel offers complimentary parking nearby and designated smoking areas. With a stay at Park Hotel Asinara in Stintino, you'll be within a 5-minute drive of La Pelosa Beach and Museo della Tonnara. 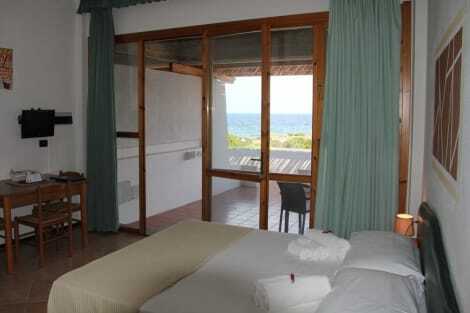 This hotel is 32.3 mi (52 km) from Maria Pia Beach and 4 mi (6.4 km) from Pazzona Beach. The hotel also has 2 swimming pool, one for children only. 2 tennis courts, five to five soccer pitch and private beach equipped with swimming pool with sea-water. 12/06 A.DP. This is a modern structure surrounded by a beautiful garden. Satisfy your appetite for dinner at the hotel's restaurant, or stay in and take advantage of the room service (during limited hours). Wrap up your day with a drink at the bar/lounge. Make yourself at home in one of the 50 air-conditioned rooms featuring minibars and LCD televisions. Rooms have private balconies. Complimentary wireless Internet access keeps you connected, and digital programming is available for your entertainment. Private bathrooms with showers feature complimentary toiletries and bidets. With a stay at Residence Le Vele in Stintino, you'll be near the beach, within a 10-minute drive of La Pelosa Beach and Museo della Tonnara. This residence is 4.6 mi (7.5 km) from Pazzona Beach and 5.8 mi (9.3 km) from Ezzi Mannu Beach. Grab a bite from the grocery/convenience store serving guests of Sea Villas. lastminute.com has a fantastic range of hotels in Stintino, with everything from cheap hotels to luxurious five star accommodation available. We like to live up to our last minute name so remember you can book any one of our excellent Stintino hotels up until midnight and stay the same night.